Posted February 11, 2019 at 12:22 am . 5 comments. 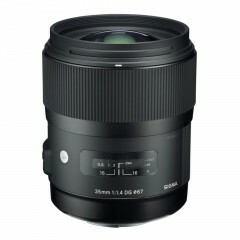 Today’s B&H DealZone (one-day deal) features the Sigma Art 35mm f/1.4 DG HSM for Canon for $699.00, when you apply coupon code “YOUGO2BH” in-cart. Save $200 from the regular price of $899. This deal is today only or until sold out. Four other mounts (Nikon, Sony E, Sony A, and Pentax K) are available. Read the post carefully 🙂 — use a coupon code to activate the $699 price. Just saw the coupon code!